Who would make your starting 5? Here’s mine. This week marked the 50th anniversary of Wilt Chamerlain’s indelible 100-point game. So in honor of this unmatched feat, I’m taking a look at the best players of all time; or rather, the best in my lifetime. Since I wasn’t around to see the Archibalds, Russells, and Havlicek’s of the world, I’m limiting my study to the last 40-something years. My criteria are simple – the best players at their position since 1970. I’m picking a starting 5 and a backup at each position. As with any ranking list, it’s totally subjective and there are reasonable alternatives, but that’s OK. Take a look at my picks and then tell me who would make your team in the comments. 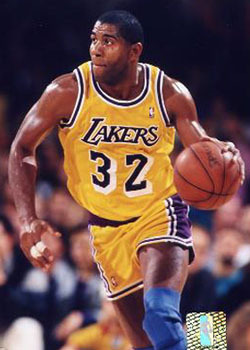 The point guard: Magic Johnson. I needed some convincing to put Magic in the starting point guard spot. For some reason the guy just seems a little fakey to me, but after further reflection, the choice was obvious. Nobody had more charisma, leadership and “magic” than Earvin. He could play all five positions. He was the leader on a team of stars, invented the no-look pass, and his numbers simply speak for themselves. 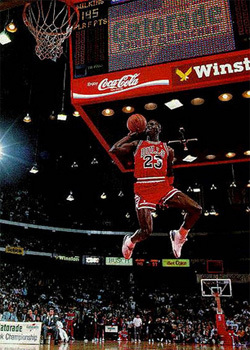 The shooting guard: Michael Jordan. Volumes have been written about this legend, so there’s not much more I can add. I remember watching him on TV and thinking to myself that no one will ever be as great. Then while working for the Spurs, I had the privilege of meeting and interviewing MJ in a post-game locker room interview during his comeback/farewell tour with Washington. I’ll never forget it. The greatest player of all time. End of story. The power forward: Tim Duncan. Maybe a homer call here, but it’s hard to put anyone else in the same class as The Big Fundamental. His skills and quickness have diminished now to the point that it’s almost hard to remember how dominant the guy was in his prime. But keep in mind that it took Tim’s arrival in San Antonio to put another great player, David Robinson, over the top to a championship. 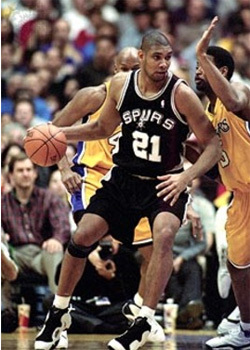 With the best footwork of any big man ever, Duncan is also the most unassuming anti-star, and best overall team player — which makes this an easy call. 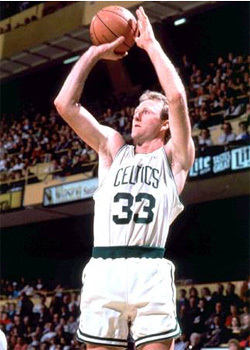 The small forward: Larry Bird. Larry Legend was literally awesome — and awe-inspiring — to watch. Perhaps the best passer in history, and without a doubt the best clutch shooter in history. At the end of the game, there was no one you wanted to have the ball more than Bird. As a 76ers fan growing up, I dreaded Celtics games because Boston always dominated the matchup. Sporting a weird looking set shot, he had a killer instinct, knowing exactly when to step on the opponent’s throat. 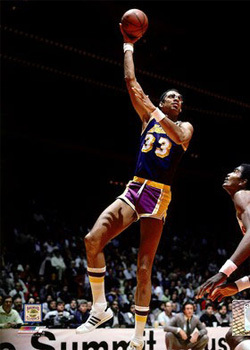 The all-time leading scorer with an unfathomable 38,387 points, he won six championships on two teams. Invented the unblockable “sky hook,” making him virtually unguardable in the post. He earned an incredible 19 all-star appearances and was MVP of the league six times.